B. Kerber, Bestände Onnasch, Berlin and Bremen, 1992, p. 74 (illustrated in color). Museu d'Art Contemporain de Barcelona and Porto, Museu Serralves, Museu d'Arte Contemporanea, Onnasch: Aspects of Contemporary Art, November 2001-February 2002, p. 116 (illustrated in color). New York, C&M Arts, Andy Warhol: Hammer and Sickle, October-December 2002, pl. 30 (illustrated in color and on the cover). 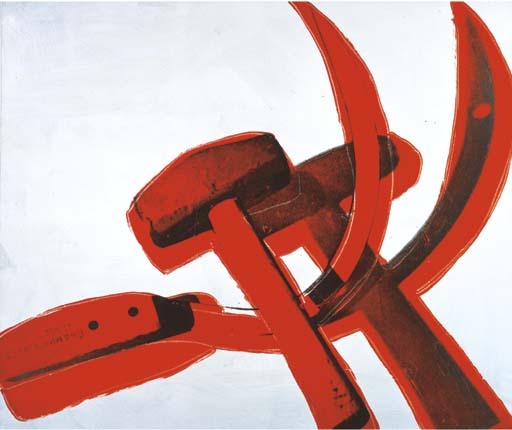 Along with his images of Chairman Mao, Warhol's series of Hammer and Sickle paintings was his most important artistic statement of the 1970s. It was a decade of social decadence for Warhol, partying each night at Studio 54 with Jackie O and Bianca Jagger, and painting commissioned portraits of the international rich by day. How perverse and provocative he must have felt dedicating a new series to the symbol of the Soviet Union and worldwide socialism, at the very height of the Cold War and communist paranoia. The idea that his rich patrons would hang such politically loaded imagery in their Fifth Avenue apartments certainly would have amused Warhol. He had been inspired however by a trip to Italy together with his dealer Lucio Amelio, where he had seen hammer and sickles graffitied over the walls of Naples by the Italian Communist party. "The drawings were so commonplace that they seemed to him almost Pop, having lost their intended meaning through repetition and functioning as decoration instead of political statement" (D. Bourdon, Warhol, New York 1989, p. 354). Warhol initially wanted to base his series on the Soviet emblem itself, but he found that the graphics were too flat and lacked the desired impact when converted to silkscreen images. Instead he asked his assistant Ronnie Cutrone to buy a real hammer and sickle from a hardware store. Cutrone then arranged the objects in various interlocking compositions and photographed them, lighting them to create strong shadows. These were then enlarged and converted to silkscreen. Warhol used a sponge mop on the floor to paint the red and white backgrounds, producing a more expressionist surface. He silk-screened the image of the tools and shadows in black on top.